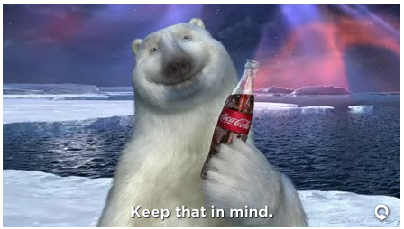 Use the Coca-Cola Ahh Giver tool on Facebook to send a coupon for a FREE bottle of coke (up to $0.99) to a friend! If they run out of coupons before you send yours, they should refresh with new coupons each Monday! i used the app to send one to my sis but it looked more like an ecard. the bear talked in bear talk. it didnt say anything about a coupon ANYWHERE on the app. Does anyone know if this is still working? This is still working. You will not see the coupon when you send but the recipient will see it once their message has been played. I sent ont to my hubby then logged into his account and I was able to print 2. When I printed it, there was no barcode. So, I don’t know if it’s a good coupon, or not. This doesnt work, i’m not even sure its actually legit because I emailed Coke twice about it and nothing ever happened. I was able to print two coupons once but there was no barcodes anywhere on the coupons. Also, before it was said that coupons are reloaded on certain days so if they run out for the week all the recipient gets it the card and not a coupon. Has anyone actually had any luck printing a coupon? Sorry out of coke, is the message they rec’d. Mine and all my friends coupons also printed out without a barcode! I did this a few months ago… three different stores refused the coupons due to no barcode.. so I removed the app… kind of lame!